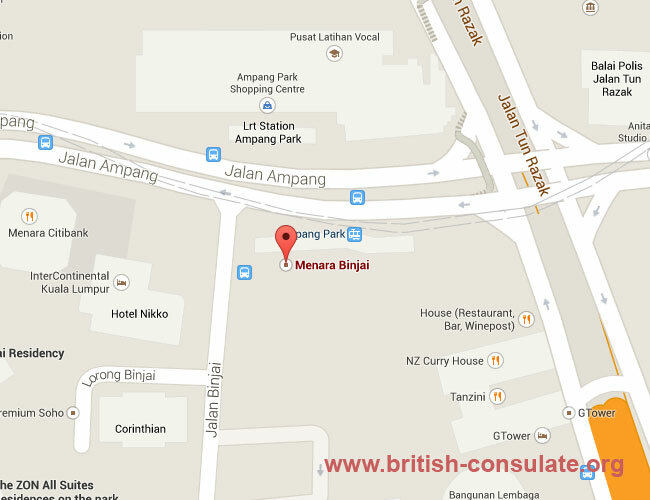 The British High Commission in Malaysia is located in KL (Kuala Lumpur). If you wish to apply for a British Visa in Malaysia then you need to speak to the staff at the British high Commission in Kuala Lumpur for more information. If you want to tour Britain then you can apply for a tourist visa or if you are married to a British citizen then you can also apply for a spouse visa for the UK. There is also a partner visa and a fiancee visa if you are not married as yet or don’t plan to get married. You can also register your marriage at the embassy in Malaysia or ask assistance with the birth of a child or a death while in Malaysia. You can also apply for a new passport or to renew your British passport in Malaysia. The contact details for the embassy has been listed below including their telephone number, map and contact details such as their email address. Note that the High Commission is not far from the Thai Embassy in KL.